Now we are armed to follow our robot from Mars as it performs exactly the same walk through the clues from the climate debate. From Figure 5, the first stage unfolds in the same way as with the creationism case. 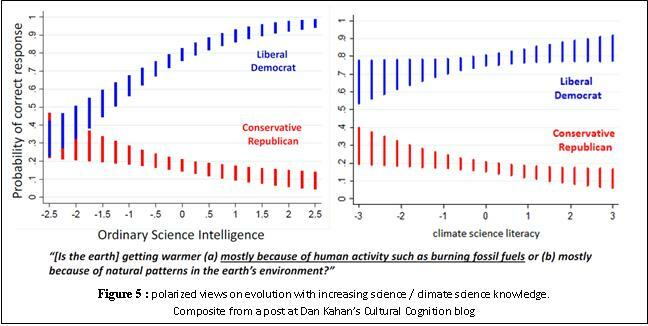 Views on climate change in the US polarize with increasing science knowledge. I.e. going right on the X-axis, those leaning more to anthropogenic dominance believe this still more emphatically, and those leaning more towards natural dominance believe more emphatically in natural causes. The extra ‘climate science literacy’ (prototype) test, filters for an even higher domain knowledge. Just like before, our robot knows this indicates strong cultural influence; initial bias sets people upon educational paths to different knowledge. (Regarding more matched gradients for the two lines than in Figure 1, see footnote 1). A key difference here though is that the initial bias and subsequent polarization on the issue is determined w.r.t. political party / ideology, and not w.r.t. an explicitly climate related framework (be it CD or ED) in the same way that creationism sits in a religious framework. Suspecting already from the creationism case that ‘party’ implies culture, which can have cross-coalitions, our robot doesn’t yet know whether Figure 5 depicts direct cultural impact (so, political), or is a result of close association. Dan Kahan, from whose excellent blog the Figure 5 data is sourced, claims that political ideology is the main source of the cultural bias and assigns it all to the Rep/Cons, by virtue of pinning the Lib/Dems to correctness via the underlined answer. Down here on the Earth this detailed Climate Etc post shows us how that assumption does not fit the data. More simplistically our robot, just like before and cautious of the biases of Earthlings, knows only that these charts reveal strong cultural influence, and proceeds in the same manner as before to identify its source. Hence it moves on to Figure 6, which can be visualized from any of many recent surveys regarding US public views on climate change. 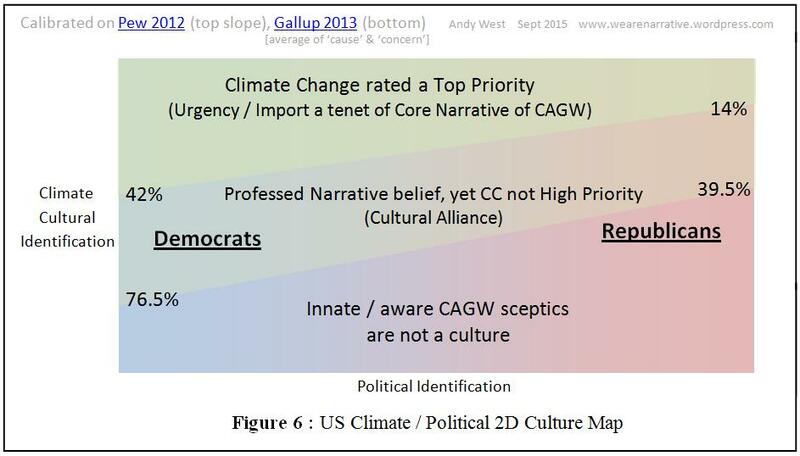 The chart shows the proportion of people professing to believe in CAGW and placing it as a top priority, the proportion of people professing to believe in CAGW yet not giving it top priority, and the proportion of people skeptical of CAGW, mapped against political allegiance. Once again, the most interesting feature in this chart is the stripe in the centre. Ask any respondents in this stripe if they believe in dangerous man-made global warming, and they’ll say ‘yes’. And yet they disbelieve a fundamental tenet of the narrative of climate change as it is propagated by world leaders and scientists and policy makers and NGOs around the world; namely that this is a critical and urgent issue. Even for the Democrats (or Dem/Libs) alone, survey after survey establishing a list of priorities for the President or government to execute on, show climate change low or very low. For this result, many of those in the centre stripe must be expressing virtually no concern at all about climate change, hence they essentially sabotage the top priority choosers. (See footnote 7 for detail regarding the variable percentage range for these charts / surveys). As polled across both parties, climate change generally comes last. This is an identity issue, just as with the creationism case. Despite an awareness of major narrative inconsistencies, the identity and social embedding of these centre respondents is too tangled with their belief in CAGW for them to deny it. Yet allowed to respond in a manner that doesn’t so directly challenge their identity, they reveal that they don’t really believe in the core narrative that dangerous man-made climate change is the issue that trumps all others. Just like before, the ‘convenient belief’ links upwards, this is where the cultural influence must be coming from. Our robot concludes the green stripe is CD.